3. The Code Previously In the first blog post, I talked about the theory behind how DNSSEC can prove that a certain Ethereum address belongs to a domain and how ENS can use the mechanism by submitting the proof into DNSSEC Oracle smart contract. In this blog post, I will show you how the actual process works on the web. 2. 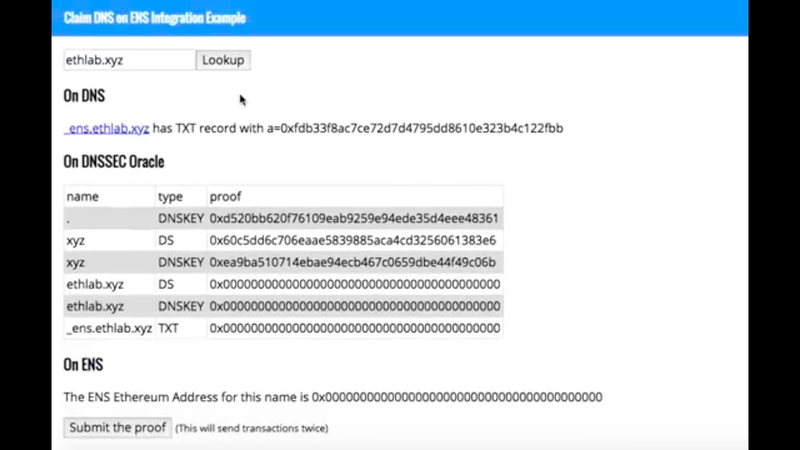 The Demo I have been working for the past few months making it easier to retrieve the proof from DNS and submit into the DNSSEC Oracle smart contract, and this video shows the first attempt where you can do the whole process online. Let’s dissect the demo video screenshot by screenshot. Step 1: Type domain name and press “Lookup”. This will show you the ETH address set under _ens.domain.xyz At this moment, no data is set on DNSSEC Oracle nor ENS so they all show 0x0 . Clicking the button will prompt to send two transactions, one to claim the proofs for each record on DNSSEC Oracle smart contract, and another one to set ownership of the domain on the ENS contract. If you look at the transactions, you can see that the first transaction is over 1.2 million gas which is quite expensive. But hold your horses! It’s likely you’ll pay a lot less in practice. Gas usage: 1252768 <= *1.2 M ! Now let’s try to set another record, ethlab.xyz. 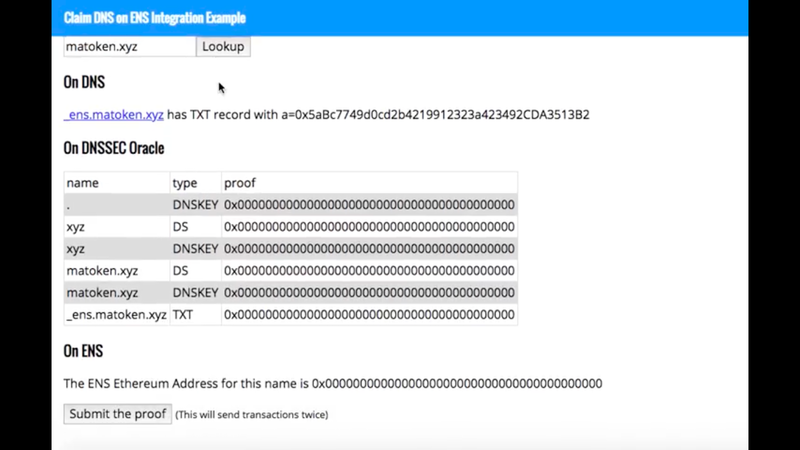 What you notice is that the first half of the proofs are already set because the proof of .xyz is already set in a previous transaction. So if you press “Submit the proof”, this time the cost of the first transaction to put the proof in DNSSEC Oracle is a lot lower. Gas usage: 373156 <= *373K ! In reality, the majority of people will be paying this amount of gas. 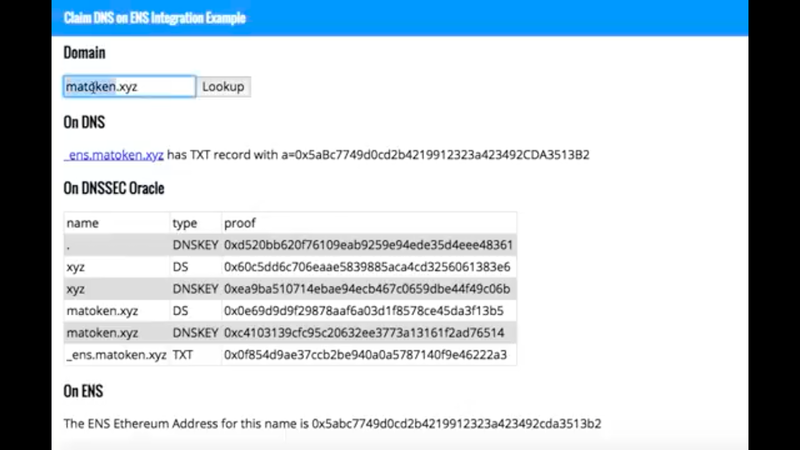 Summary In this blog post, I showed you the demo app which allows you to claim DNS on ENS. I also explained that transaction cost becomes lower if part of the proof has already been submitted. In the next blog post, I will show you how the demo code make use of a series of ENS libraries.